Published in The Advocate, December, 2012 - Far too many people in British Columbia depend on food banks to feed themselves and their families – and sometimes the food banks are just not able to meet the need. 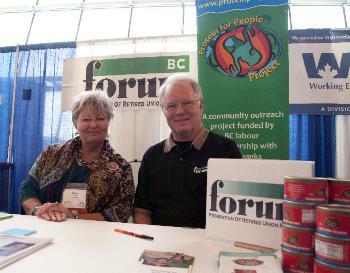 That’s why BC FORUM has joined Protein for People, a unique community partnership that works to address the shortages of protein at food banks, as well as the shortages of an economy that leaves people vulnerable. “Food banks across the province are struggling to provide essential food, such as protein, to the growing number of vulnerable people who have lost their jobs, or work at several low-paying jobs, and are forced to turn to food banks to feed their families,” says John Radosevic, President of Protein for People, and a director of BC FORUM. Protein for People has helped food banks through direct donations of protein-based food and has helped food banks to get better volume based-prices which means food banks can maximize their purchasing power. Protein for People, a non-profit society, was started in 2006 by unions and the United Way. “Labour unions have always been active in community services but Protein for People is a way for labour to contribute in its own name,” says Radosevic. “Protein for People is a union owned and operated charity. It recognizes both the need for better solutions than food bank lines. It also recognizes that we can’t just watch people go hungry while the fight for better public policy goes on. “‘What we desire for ourselves, we wish for all’ is an old union slogan, but it’s apropos,” says Radosevic. Through Protein for People, the province’s unions are stepping up to the plate by making monetary donations which are used to purchase protein products. Proteins like meat, fish and eggs are hardest for food banks to obtain because of the cost factor, so food banks must purchase them to make up the shortfall. In May, Protein for People announced the delivery of $87,226.00 worth of canned, prime BC pink salmon to food banks throughout the province. The donation was made on the final day of Hunger Awareness Week, a national event dedicated to raising awareness about the solvable problem of hunger in Canada. “The difficult part is that even with the donation of those 81,000 cans, the need is still much greater. In a country as rich as Canada it’s unacceptable to see people lining up for food. It’s a poor reflection on our country and humiliating for those who are most vulnerable. “Over 40 percent of food bank groceries are consumed by children of one and two parent families living in poverty. It is time politicians paid more attention to the impact that hunger and poverty has on our communities, and the damage it does to our society,” says Radosevic. Each year Protein for People hosts several forums that bring together those using food banks, union volunteers, and service providers for a community fair. The forums are an important part of the outreach, connecting people with solutions and sharing food and music together. At least ten labour council sponsored Protein for People community forums were held in 2012, each attracting between 400 and 700 people. “Bringing over 4,000 yet-to-be organized people to a labour event is no small achievement,” says Radosevic. 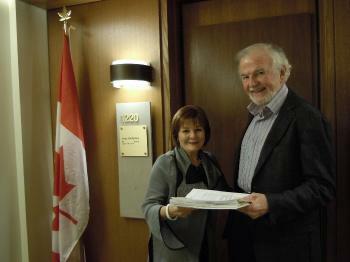 Hold Stephen Harpers’ Federal Conservative Government Accountable NOW! May, 2012 - Federal NDP House Leader, MP Nathan Cullen of British Columbia, is asking for your participation TODAY! The Harper Conservatives are playing games with our country’s future, and the official Oppostion NDP needs your help to hold them accountable - right now. The Stephen Harper Conservatives are trying to ram hundreds of pages of harmful measures through Parliament - without adequate study or debate. The Conservatives have rejected the NDP’s constructive proposals to study and debate this ‘Trojan Horse’ bill. So it comes down to all Canadians to work together to hold them accountable. The Official Opposition have launched their own budget review sessions across Canada with Canadians, and now need to hear from you. 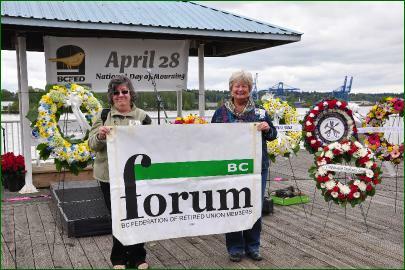 April 28, 2012 - Sister Sandy Bauer (left), BC FORUM Regional Rep at the VDLC, joins with Sister Diane Wood, BC FORUM Secretaryat the April 28 National Day of Mourning event that took place in New Westminster. April, 2012 - Sister Mona Sykes, BC FORUM Regional Rep for the Victoria Labour Council, volunteered to promote BC FORUM information and membership at the 2012 CUPE BC Convention that took place at the Victoria Conference Centre. Missing from the photo is Brother Gord Larkin who was also in attendance. 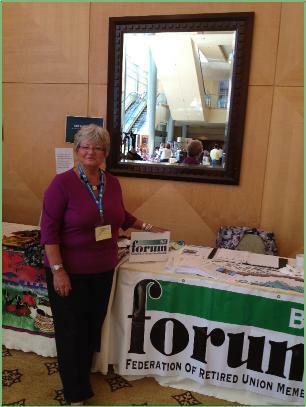 April, 2012 - BC FORUM Secretary Diane Wood staffed the membership table for the organization at this year’s Health Sciences Association Convention that took place in Vancouver at the Hyatt Hotel. 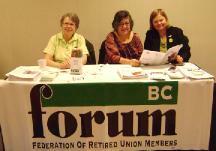 March, 2012 - Representatives of BC FORUM attended this years BC Teachers Federation Convention in Vancouver to share information about retirement issues and promote membership with BC FORUM, while giving away promotional BC FORUM mini-frisbees! Top photo: Miriam Olney, Treasurer and Sandy Bauer, VDLC delegate, with Iris Taylor, CLC Rep.
Bottom photo: Miriam Olney, Treasurer and Sandy Bauer, VDLC delegate talking to convention delegates, Deb Hooper from Blind Bay and Heather McDonald, Salmon Arm.